This entry was posted on Saturday, June 5th, 2010 at 9:13 pm	and is filed under LED TVs. You can follow any responses to this entry through the RSS 2.0 feed. You can leave a response, or trackback from your own site. I just received my LN46B650 today so I may update this review in time. Feel free to comment with questions and I’ll try to respond to them in later updates. The box for the LN46B650 comes is not too much larger than the TV dimensions itself. Sometimes you’ll see a 32″ TV come in a box that could easily fit one much larger. I wouldn’t exactly call it environmentally friendly, but the box easily fit through doorways and into the elevator of my apartment building. The box is fitted with Styrofoam at the corners to keep the TV in its place and inflated plastic bags filling in all the empty space. There is the typical screen protective plastic in place and I found that the TV came in excellent condition with no noticeable shipping damage. I did not use Amazon.com’s shipping company, the handling of other shippers may vary. In the box is the stand (which comes with assembly instructions, though mine was already assembled), remote, 2 x AA batteries, a USB flash drive containing multimedia content and the TV instruction manual, a cover for the bottom of the TV in case you wish to mount it on a wall, a cleaning cover,screws for securing the stand to the TV, a power cord and a software CD for connecting the TV to a Windows Vista or XP computer via ethernet connections. Moving the box by myself was a bit difficult as it is still quite larger, once I got it out of the box though, the TV is very light for a 23 year old male and getting it on the stand was very easy. Once on the stand it snaps in place, you can (optionally) insert screws to keep it locked into the stand. Inserting the power cord and connecting my components to the TV was easy, but the cable management system for the TV is pretty much non existent — cables pretty much dangle behind the TV. There is a lot of debate about whether the Touch of Color Red Design is a good thing or bad thing. Also, you’ll see on last year’s models that some people claim it’s barely noticeable while some people claim it’s a major game changer. My TV sits on a black TV stand in a spot in the room that sits in the shade — I can barely see the red color. However, I feel that if you were to shine a lot of light on it, it would quickly become very noticeable. The bezel is not quite as thick as I thought it looked in the Amazon.com pictures (which are Samsung’s official PR shots). There is a somewhat “fat” pointed chin which I don’t think looks too terrible. If you look at the pictures you’ll notice that the glass of the bezel extends about half an inch beyond the actual TV bezel, I kind of like it. The neck of the stand is a glass pillar and very nice looking. The stand itself is surprisingly deep compared to the TV stand, but, again, not a bad thing, it’s just hard to see in the pictures. The built in TV controls sit on the bottom right hand corner of the bezel and are impossible to see from more than a foot away. It’s a good thing for watching movies, but when I told somebody how to lower the volume on the TV, they couldn’t find the buttons. I should also note that the buttons are touch sensitive there’s no tactile way to find them or get feedback when pressing them. To the right of the buttons is a red light that turns on when the remote is pressed or the TV controls are pressed. It is otherwise always off unless the TV is in standby. I should point out that the TV is very glossy and during very dark scenes it is absolutely necessary to shade your windows. Even when the not in dark scenes, I found that the bezel reflects what the screen does not. When I closed my blinds, the TV looks absolutely superb. The bezel is no longer noticeable, dark scenes are fantastic. The remote is fairly straight forward. The design is just a tiny bit red like the TV bezel, buttons are nice and large and easy to memorize. The backlight button for the remote sits in the top right corner of it and when pressed illuminates the keys fairly well. There are a good number of connectivity options which are thoroughly explained on the Amazon.com specs or on Samsung’s website. Turning the TV sent me through a few welcome menus that I didn’t particularly want. The first thing the TV did was begin scanning for channels — but I have my cable box connected via HDMI so there was nothing to scan. Stopping the channel scan process was easy, though, and when I got out of the welcome menus and switched to the HDMI 1 source, the TV was easy to use. The menu layout is not atypical of other HDTVs you may have had the chance to use. Pushing the menu button brings up a series of menus indicated by pictograms for picture, audio, antenna setup, general TV setup, input setup, Application (media/internet functions) and Help. One thing I don’t like, is that one feature that I like to be able to adjust on the fly, automotion plus (or refresh rate), is buried in menu -> picture -> picture options -> Auto Motion Plus. It’s a pain to get to if you’re just trying to adjust the setting for one channel. I connected my TV directly to my computer network via ethernet cable. I had absolutely no issue in setting this up, the TV detected my network settings without any problems. One nice feature is that you can rename the sources on your TV to pre-designated alternates. For an example, I named HDMI1 “Cable Set Top Box” and HDMI2 “Game” and Component1 “DVD.” It makes things easier for non-technical people. Picture settings are always retained based on the source, if you keep your HDMI source on “movie” mode and adjust the picture settings, every time you watch HDMI these settings will be restored. I need to start out with my favorite feature on the TV: Customized Auto-Motion Plus. For those of you not familiar with the feature, it’s what Samsung calls their 120hz capabilities. If you look at older LCD TV screens you might find that the picture tends to look blurry or judders in fast motion sequences. This technology, found in most middle and high-end LCD HDTVs in 2009, adds in extra frames to smooth out the motion. On my old XBR4, I could adjust the 120hz to either off, standard or high. On the LN46B650, I can adjust the blur from 0-10 and the judder from 0-10. It’s a great feature, I’m still toying around to figure out what I like most for which content. Other unique features not in other brands is the Internet Content which includes a series of Yahoo Widgets. I must point out that these features are VERY slow regardless of your internet connection. It takes about 20-30 seconds to start them up initially after you turn your TV on and then take about 5 seconds to load from that point on. There is a significant lag when switching through the widgets content. The built in widgets include weather, news, flickr and finance. I’ve heard there are more widgets coming out soon — possibly a Netflix widget? — but as of April 30, 2009, there are none available. I’m praying that future firmware updates to the TV fix some of the slow speed. cnet.com provides a more thorough review of these features. The TV also comes with a fair amount of material stored in its internal memory and Samsung also includes it on a flashdrive which you can tweak on your personal computer. Pushing the content button on the remote closes whatever your watching and offers you a photo gallery which has pictures of art in slide show form (accompanied by adjustable music), a few recipes (why? Do people actually want to read recipes off of their TV screen? Is somebody putting a 46 inch LCD HDTV in their kitchen? I must say, though, the pictures of the food looks good), games (haven’t tried these yet, I don’t know if I ever will), children (a bunch of stories that look like flash cartoons with subtitles for kids to read along with), and wellness (a bunch of nature audio tracks and a few piano pieces). There is a total of 189 MB on the TV set aside for this content, you can download more of it off the internet or load it on via USB flashdrive or hard drive. It’s really nothing too exciting, I have no intention to use it. But, I will point out, that it’s far easier to use and faster than the Yahoo Internet Widgets. The TV hooks up to an external hard drive or flash drive. I connected my 4 GB flashdrive with a bunch of movies formatted for my iPod on it. The TV played them without any problems, but the stretched content did not look too good — that’s no surprise considering the iPod screen is less than 3 inches in size. Eventually I might try to move some saved HD content to my flash drive. The Help section of the menu is fantastic for those who are not familiar with HDTV settings. There is a “product guide” which pretty much explains how to use most of the TV’s internet and content features, an explanation of how HD picture quality varies and works — pretty much a powerpoint presentation — and how you can use the TV’s settings to get the most out of basic features and an explanation of how to save energy with TV settings. A self-diagnosis section brings up a sample HD picture or audio track to test to see if there is a problem with your TV. I imagine if you start seeing artifacts on your TV or quality problems it might be a good way to see if it’s the TV or a component you have connected to it. This section also gives you contact info for samsung and is where you go to upgrade the TV firmware. Your TV is not usable when upgrading its firmware (or internal software). There has been a software upgrade issued since this TV reached the market. It takes less than 2 minutes to download and install over cable internet. You’ll find that there is a myriad of picture adjustments you can make. As I mentioned, the 120Hz refresh rate and dejudder modes, also called automotion, is superb. There are five color temperature presets, I like the warm2 the best with the naked eye but you can make custom adjustments to the white balance and colorspace settings. There’s a film mode to use 2:3 pull-down — including on 1080i sources — gamma adjustment, dynamic contrast control, black tone controls and a flesh tone setting which I haven’t toyed with at all. You can adjust the aspect ratio to turn overscan on and off or to stretch the picture, etc. These are typical on most mid-high end HDTVs for 2009. There is also picture-in-picture via different sources available if you use features like that. There are also some energy saver features, which will adjust the brightness and other power consuming functions as you wish, but you’ll probably see a decrease in picture quality the more these are turned on. I haven’t had a chance to get out any calibration equipment and do anything serious to see how the TV looks at it’s best. Out of the box, my first impression is that the picture quality is superb. I made some quick tweaks based on my personal preferences, but the colors seem to be very deep and accurate to my eye. Blacks are very very dark. I saw an early review of this TV that complained of clouding on the TV at the corners, I haven’t seen any evidence of that no matter how dark I try to make the room. The screen appears to be very uniform from what I can tell with the naked eye. I might do some tests later, but I think some people have already done so on avsforum.com. I can’t imagine the typical viewer being disappointed with any aspect of the picture. It’s probably the best HD picture I’ve ever seen, though I haven’t seen most of the 2009 models, I’m gauging this based on 2008 models. But in sum: great contrast, accurate colors, great customizable processing, deep blacks, uniform screen. I know there is some confusion about whether this is 10-bit or 8-bit unit, and I can’t be positive (is there a good way to check?). I will say that there is no noticeable color banding at all that you might see in an 8-bit unit. I took a look at SD content from both a DVD (via component cables with no upscaling) and cable TV. Obviously, it’s no where near as good as HD content. I will say that if you want a TV at this size, regardless of what TV you get, you should shell out the bucks for HD broadcasting or at least a blu-ray player. With that said, the SD quality is pretty good. The picture still looks detailed with good noise reduction and gets rid of most of the moire issues you might encounter on other sets. The sound quality is fine. Nothing great. The speakers of the TV fire downwards, so sometimes it sounds like that the voices of people on the TV are coming from the TV stand rather than the screen. I use my own speakers for most content and I suggest you consider doing the same if you’re an audiophile. I won’t go into sound quality much more than that because if you really expect a flat panel TV to have mind blowing sound, you need to reassess your expectations. If you’re a gamer, and I mean a *serious* gamer, and need a very fast response rate, then you might want to consider a different TV. Even when game mode on this TV is turned on, you won’t be 100% pleased. If you’re a more typical gamer or don’t play games, this should NOT affect your opinion of this TV. I’ve played my xbox 360 and it is more than apt for the typical gamer. I can’t imagine casual gamers running into issues especially since gaming where timing is crucial — like guitar hero or rock band — allow you to calibrate the game to compensate for any delay. I’ve tried playing with my xbox 360 a little bit on it and I haven’t had any problems. I also should point out that I watched the Netflix live streaming HD content via xbox 360 connected over HDMI and the content looks superb. As I mentioned before, the automotion features of this TV are superb. I love being able to adjust it to my preferences exactly. If you get this TV, you won’t be disappointed with that feature. The Picture quality of this TV is absolutely superb compared to all the 2008 LCDs I’ve seen and I imagine it is one of the best of the 2009 models. The features are expansive but you’ll probably not end up using the internet or media content built in unless Samsung improves it. The screen is glossy so beware of bright rooms! Don’t forget that — I mentioned it early in the review. Otherwise, I can’t imagine a better picture from an LCD. Feel free to ask questions in the comment and I’ll try to update again soon. So there was a question as to what the problem is for gamers. Let me be clear, the graphics quality with games is still excellent on my xbox 360. I have played with 120hz at full with the games and the processing is very good. I’ve also played with game mode turned on which exchanges some of the picture quality for better latency. Before I continue, let me note, once again, that this is NOT a problem for a large majority of gamers. So then what’s the problem? When comparing this TV to a high end computer monitor there is a bit more input lag. For most people, this is completely undetectable, but it is there despite that this TV has far superior picture quality to pretty much every other LCD out there in the price range. For those of you not familiar with input lag, what it basically means is that when you use a video game, there is a slight delay (and I’m talking nano or miliseconds) between when you press a button on the controller/mouse/keyboard and when the change is registered on the screen. There is ABSOLUTELY no TV or computer screen out there that has 0 lag and there are other factors that play in here (such as the speed of the computer or game console). I did a few homemade tests and I estimate that the input latency is about 30-35 ms on average with game mode turned on or about 100-120 ms with game mode turned off. 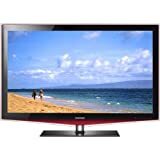 That score is actually pretty good compared to most LCD TV screens in this price range, but doesn’t keep up with some of the high end Panasonics which are renowned for their low latency. For most people, anything less than 150-200 ms is usually perfectly fine. For others who play a lot of online games with their PC hooked up to their computers and need maximum efficiency, they might want to look at some Panasonic models. Please be careful, the response rate on the TV is rated at 4 ms. That is true. The pixels on this TV should average a 4 ms response rate which is excellent. What I’m talking about here is the lag it takes for the TV to register a change made in a game controller, through the game console or computer and through the TV video processing. The input lag has nothing to do with picture quality — in fact, it’s likely that less input lag also means less picture quality — or audio quality. It will not be noticeable to most gamers. I’ve had a chance to watch a lot more SD quality broadcast on SD channels and have to say that after tweaking some settings, I’m really thoroughly impressed. This is some of the best SD rendering I’ve seen on an HD set. Colors pop very well and the AMP cleans up a lot of the blur well when you get it to just the right settings. I spent some time last night watching baseball games switching between HD and SD feeds and found that I could get the movement of the ball and swing of the bat to look pretty good on an SD feed and when in HD, the AMP handles it very well in 1080i. 720p actually looks a bit better when following balls hit into the field, but this is to be expected with progressive rather than interlaced video (there’s a long explanation I could go into for this, but, for simplicity sake: 720p/1080p will show most motion better but is especially good when the entire picture is moving — like camera pans — 1080i is actually pretty good when the camera is steady and there is one object moving on the screen, but terrible when the camera pans or there are a lot of objects in motion). If you’re not picky or usually don’t calibrate your TV, there’s really no need to do much to the default settings. However, you might notice — as I’ve noticed on my own TV — that the blacks tend to be a tiny bit blue tinted on the default settings. My largest goal with these settings was to calibrate the TV accurately, but mainly get rid of that slight blue tint. A comment was posted in reply to this review that the B750 is a hands down choice over the B650. I just wanted to note that the B750 probably is a superior model to this one, but it comes at a higher price. There are three key changes to the B750 model: 240hz refresh rate, a matte screen, 150,000:1 contrast ratio. This all costs about an additional $250-$300 depending on when/where you buy. For some people, that isn’t much of a difference when you’re already spending nearly $2000 on a TV, and if that’s the case, I see no reason not to buy the b750 model. I think it’s also worth note, however, that cnet and other reviewers have argued that the benefits of 240hz refresh rates over 120hz is fairly insignificant and difficult to notice (see their reviews for the Sony XBR9 series and last year’s Sony KDL-52XBR7). Their chief TV critic argues in separate article in 2008 that 240hz was not worth waiting for. But, I still think it’s worth going into a store and taking a look at the differences between 240hz and 120hz before making a final decision. The matte screen is really a matter of preference and your room. I’ve already noted in this review that the B650 screen is very glossy and, in dark scenes, may reflect ambient light in the room. A matte screen should reduce these problems (though it’s unlikely it will completely eliminate them). At the same time, a glossy screen can make colors “pop” more and sometimes make blacks look even deeper. As far as dynamic contrast ratio is concerned, there is a lot of debate in the A/V community about how these measurements are taken and how well they can be used to judge actual quality. The dynamic contrast ratio is a measure of the difference between the screen’s whitest white and blackest black. That means they measure the white with the TV screen brightness at maximum and the black with the brightness at its darkest. These measurements can further be thwarted by the coating on the screen (a matte screen vs a glossy screen on top of the same panel will yield different results). Also, there are absolutely no standards in how these measurements are taken. That means that Samsung can use different methods to measure the contrast ratio on different models. Likewise, Sony likely uses a very different measurement system than Samsung. That’s not to say the B750 contrast ratio is the same (or worse) than the B650, I’m just saying that it may not be discernible to your eye. You need to judge it yourself. As I’ve said, the best way to evaluate these differences are to see the models in person. If you do, make sure that you are watching an HD source (preferably a 1080p blu ray player) and that each TV is connected to the HD source in the same way and are showing the same movie. I bought this TV because I needed one before the b750 was scheduled to be released, otherwise I might have given the b750 much greater consideration. –UPDATE May 8, 2009 — ONE WEEK IN…. So I’ve had this TV for 8 days now and I have to say that I’m still very please with my choice. One item I have noticed that I didn’t point out before is that the bezel does pick up some dust. I think this is because when it was in the box it developed some electrical charge. Hence, Styrofoam kind of stuck to the bezel a little bit. A few swipes around the bezel with a swifter seemed to get all the dust off. Since then, I have tried to avoid touching the bezel as it does pick up finger prints fairly easily. However, I, for one, rarely touch my TV screen and don’t mind this as it gives the TV a nice glossy look (which makes it better to look at it when it’s turned off). Another feature I wish Samsung had included would have been a height adjustable stand. I know that most TV’s don’t have this option, but I feel like the TV sits just an inch or two too low for my tastes. I measured the distance between the bottom of the base and the bottom of the actual screen and it’s about 6.5 inches. If you want the screen any higher, you’ll either have to get a higher TV stand or wall mount the screen. Another feature I’ve tried using is the automatic volume control, which I haven’t been too impressed with. As I said earlier, I didn’t expect much from the TV speakers and usually use my own sound system. But, if you’re expecting to use the TV speakers, don’t expect much from the auto-volume control. What the feature is supposed to do is keep the volume consistent between channels and sources. I actually found myself adjusting the volume *more* when this feature was turned on than when it was turned off. Also, a quick update on the Yahoo! Widgets: there are a bunch of new ones out! There are a few games available now and an app for Twitter and Yahoo video. I installed the latter two and can say that, though I don’t really use twitter much, it’s kind of neat being able to see all your friends’ updates from your TV screen when you’re too lazy to check a computer or cell phone. The Yahoo video content isn’t exactly HD quality. In fact, it looks significantly worse than typical SD cable quality. I suppose that should be expected since the video content is meant to be played on the web. The video selection isn’t as broad as you might see on YouTube, but it’s fairly well categorized. I watched a few movie trailers on it before I decided I’d rather watch the HD quality ones on my 15 inch laptop. The speed of the widgets have improved a tiny bit. Once you update the TV firmware to version 1007, you might see a moderate improvement. However, going through the various screens to try to access an item like a Yahoo video can feel slow and tedious. I think Samsung and Yahoo have a nice idea here, but it’s hardly a winner. Yet, my biggest priority when buying an HDTV was the picture quality and in that respect this TV is still a definite winner. Even from off-angle viewing, I’ve been very impressed by the color accuracy, black levels, screen uniformity and video processing. Add that to its superb connectivity, an attractive design and usability and that’s why I continue to give this TV five stars, hands down. The cons of the TV have been mostly what I consider secondary features: internet functions being slow and the audio not being anything special. Feel free to keep asking questions in the comments section and I will try to reply when I can. Also, check out the reviews on the other size models of the B650 series as you should see very similar video quality. If you’re into tech talk, it’s also worth checking out some of the discussion on avsforum.com where they have a decent thread started on the B650 models. I’m not a participant, but some people have provided a good bit of insight. There are lots of in-depth reviews of this TV on the web, so I won’t go in to too much detail here. I will say that the picture quality is awesome on this model, and that I’m very happy with my purchase. The red touch of color isn’t too obvious (I still wish Samsung would abandon the TOC though). The swivel base is nice, too. The “auto-motion plus” (AMP) feature is improved over the 2008 model by allowing you to fine-tune the settings more. AMP is the technology that fills in extra frames (120Hz) so video doesn’t look so “jerky”. Owners of the 2008 model sometimes had complaints that they could not adjust the AMP setting enough to their liking. The 2009 model allows greater customization. “Game mode” helps eliminate the lag when playing games. Once I turned this mode on, there was no lag when playing “Rock Band” and other games on the PS3. I am using HDMI v1.3b cables that only cost a dollar from BargainCell. Images are awesome. Don’t spend more than that for HDMI cables!!! Research the web or look at the reviews for HDMI cables on Amazon to find out why. You will not notice any difference in image quality no matter how expensive an HDMI cable is. The sound on the TV is a little flat, and doesn’t have much bass. But I am hooking my PS3 and DirecTV sound to an Onkyo receiver and Energy speakers (which sound great! ), so it didn’t matter to me. Keep in mind that the 650 models (like this one) have a gloss panel. This causes reflections to show from windows and lights. If you’re looking for the semi-matte screens that help cut down on this, you’ll want to check out the 630 models. My TV was shipped via Pilot freight services. They made a courtesy call to me stating that because of where I live, that one of their partners (a moving company) would be making the delivery. As a result, it tacked on a few extra days for the product to arrive, but it arrived in perfect condition and the moving company set up the TV and made sure it worked and that I was happy with it before they left. All-in-all, I’m definitely pleased with this TV. Bought this TV in August 2009 from Best Buy and it worked well for 3 months. Started having flashes of pink when changing channels and eventually vertical lines, like a barcode, appeared over screen. Also would get “ghost” images from previous channels. Called Samsung customer service and they sent a repairman from another state. This took about one week. He replaced the main board and an internal cable — took only 15 minutes — and the TV appeared fixed. Exactly 7 days later, the same problem re-occured. I called customer service AGAIN and said I wanted a new TV and they stated their policy is that there is a minimum of 3 service appointments needed before they would even consider product replacement. I wanted to speak with a supervisor but was told that was not possible. Unbelievable!! I told them this doesn’t speak well of their customer service. We are again without use of this TV. The repairman called and said he is ordering a whole new screen and another main board but this will take another week or two, which is very aggravating. Incidentally, a friend of ours had problems with his new Samsung TV and had to go through numerous repair attempts, which failed, but eventually got a replacement. Still frustrating. I did alot of research before purchasing a TV and Samsung seemed to be the top choice for quality. Maybe we just got a lemon and I understand that happens, but Samsung should be more considerate of their customers and replace a TV when needed without making us jump through hoops. So here we sit, unable to use the TV that we paid for, and hoping this next repair works. If not, another call to customer service and probably another “run around”. The B650 has a MUCH clearer picture. And by “clearer”, I mean more defined with a sharper contrast, brighter whites and darker darks. I attribute this to the doubling of the contrast ratio. The A650 has a 50,000:1 whereas the B650 has 100,000:1. For those that do not know about contrast, the contrast ratio measures how many stages there are between the darkest dark to the whitest white a crystal can do. The problem is that the manufacturers do NOT use the same standard for what “dark” really is. Additionally, their darkest dark is measured when the tv is OFF – not very helpful since you’re not seeing how dark the crystal can actually get. The B650 looked like a HD set while the A650 looked like a regular flatscreen. I had the salesman put both tvs with the same settings to compare the two realistically. I also looked for the motion and “ghosting” that occurs when action is moving. For this test, I looked closely at a soccer game being displayed on the two tvs. Again the B650 did not show quite as much “trailing” that the A650 did. Although both sets were 120hz, the B650 out shown the A650 hands down. The response time (how long the crystal takes to go from white, to dark, back to white again) for both of these sets is 4ms; but the B650 seemed to have a much more fluid motion – much like if you were watching real life. I am going to hold out some more to see if the price of these go down, but I am definitely going to purchase the B650 instead of the A650. Honestly, the best way is to go to Best Buy and see for yourself. Don’t be afraid to ask the sales people to adjust the color and contrast for you. Hope this helps someone decide which version you go with. It should be noted that not all TVs, although the same model are not created equal. If you can, get two TVs and keep the best out of the two.